the land of the mighty Chomolungma (Mt Everest) and the mother of many 8,000-metre-high snow-capped peaks, Nepal has no less than 6,000 odd fast-flowing rivers and a total annual outflow of 150 billion cubic metre (bcm). This "so-called colossal water potential of Nepal" is just a "socio-economic myth", according to Dipak Gyawali. In his seminal work Water in Nepal, Gyawali launches a powerful attack on the belief wedded to mere physical abundance of water, viewing water in its everyday social, cultural, spiritual and symbolic contexts within the rubric of Nepali society. The book takes a bold stride into the forbidden realms of the 'ivory tower' of an unchallenged water bureaucracy, which so far, has largely been unable to address the concerns of equity, efficiency and sustainability. 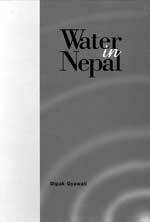 Reader-friendly, comprehensive and balanced, Water In Nepal holds our attention with its forceful arguments. The analytical strain in the book searches for a cogent, farsighted and holistic attitude in the development of water resources, by going beyond the straight-jacket of a strongly supply-focused construction enterprise. Recognition of the social embeddedness of water resource technology is the prime objective of the book, while promoting a climate where history, politics and even religion shall meet with engineering and economics. With this objective in mind, the author effectively sketches the society-technology interface, using Cultural Theory as a weapon to track down contradictions proposing a healthy and constructive public dialogue on water issues. A chronicle of Nepal's water resource development in the last two decades, the book captures the debates and issues in the thoughtfully compiled essays. The author explains the inherent difficulties behind Nepal's water resources development. The book begins by giving an account of the major water controversies and conflicts generated in the 1990s, viz. the Arun iii and Tanakpur hydroprojects and the Mahakali treaty between Nepal and India. One can see, how the hegemony of donors, and uncontrolled market forces, lead to a loss of autonomy over the management of water resources. Such a lack of democratic consultation, accentuate the crisis of governance and institutional distortions in Nepal, fuelling social tensions both within and across national borders. In a close look at the water woes in downstream Bihar, Gyawali describes policy slips of a single-mission bureaucracy, tied down to the construction of embankments and surface irrigation schemes. Keeping Nepal in the background, Gyawali proposes the environment for a new pluralistic research agenda for the Himalaya-Ganga region with the spearhead logic of his "Three- Legged Water Science". This relates to the question of a constructive engagement between the government, market and the civil society, creating space for the evolution of effective alternative approaches to water management. The book goes on to mirror the author's earlier philosophies as a political economist, where he wisely specifies the need to concentrate on domestic development, and the need for "confidence-building measures" to facilitate a regional dialogue on water sharing. In the second part of the book, Gyawali carefully notes the complex relationship between the biophysical environment and the human socio-ecosystem. And with this, takes an interdisciplinary look at uncertainties and gaps in knowledge, that exist in the way of taking wise decisions on the management of water resources. The author then moves on to suggest an alternative paradigm focusing on human rights, setting up a healthy contesting ground among government, market and community. This needs to find expression in "economic decentralisation and socio-political pluralism", linked to an ongoing dialogue on policy, and restored through a democratic devolution of power, from the national to the local level. Gyawali's book, however, seems to suffer from the author's desire to target a larger readership and in the process it tends to be too easy and journalistic. Nonetheless, Water in Nepal, is a visionary masterpiece, challenging the fundamentalism of technocratic reductionists in conventional water resource management, with the concern of a realist.